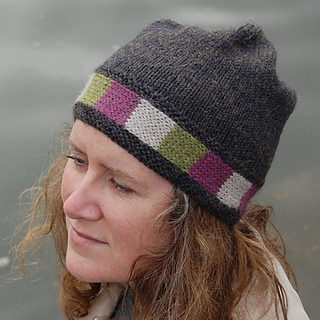 A simple, slouchy beanie with gentle colour around the brim. Part of the Safe Haven story, this co-ordinates with the other pieces. 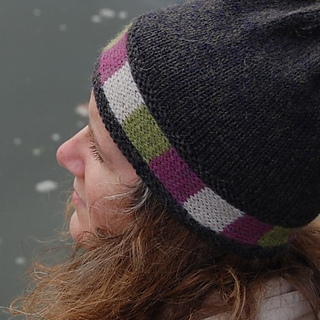 This hat is a warm, but lightweight, single layer of baby alpaca. 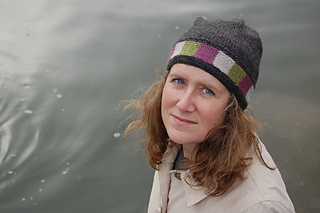 Need an even warmer hat? Try the double-layer version, Storm Warning. 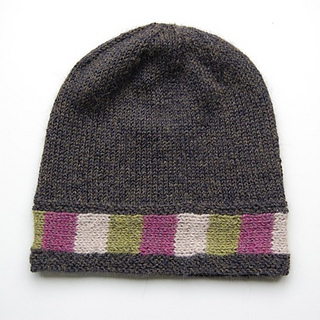 The colourwork is all simple stripes, no intarsia. There are some stitches to pick-up, and decreases to work at the crown. It can be worked flat and seamed, or seamlessly in the round. You only need a small amount of each of the contrast colours. This means you can use this pattern to finish-up contrast yarns from making some of the other gorgeous projects in the Safe Haven ebook. 120m/130yds (150m/165yds) Licorice 803 (A). 10m/11yds each of Relish 808 (B), Bubblegum 811 (C), Taupe 505 (D). OR worked in the round: 3.25mm/US 3 & 3.75mm/US 5 needles for your preferred method of working in the round - either double pointed needles, two sets of circulars or a circular with 80cm/32” cable for magic loop. Optional in round: materials for short provisional cast on & grafting. 22sts & 30 rows to 10cm/4” sq in Stocking Stitch/Stockinette with 3.75mm/US 5 needles or size required to get gauge.